Mix the Ginger, garlic, black beans in a bowl along with the light soy and set aside. Place the salmon fillet in a shallow dish/bowl with a little vegetable oil on the bottom to prevent from sticking. Season the salmon with the salt and white pepper. Pour all of the sauce on top of the salmon and leave to marinade for up to 1 hour if you have the time. 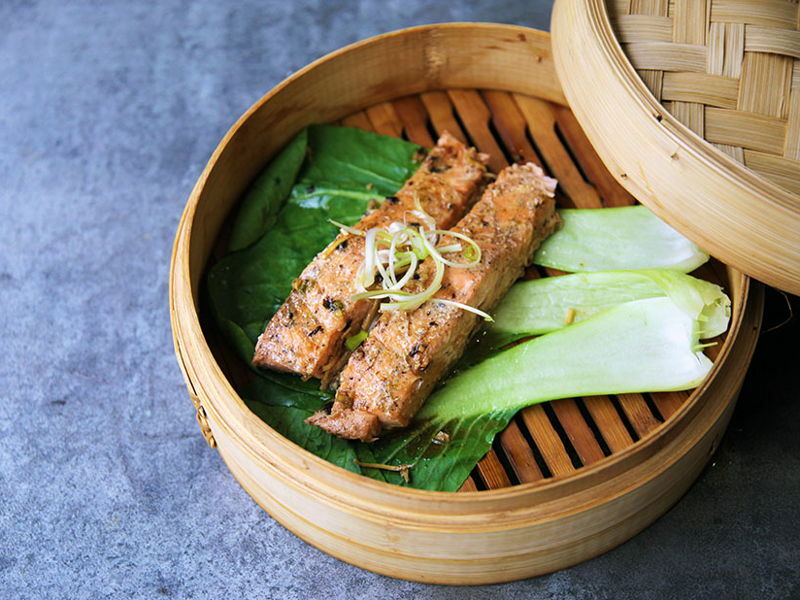 Place the dish into a bamboo steamer, drizzle a little vegetable oil over the salmon and place the lid on. Heat up your wok with some water, once the water is boiling, place the whole bamboo steamer into the wok and let it steam for approximately 8 minutes. Alternatively, if you don't own a wok and bamboo steamer you can make a parcel for the salmon with Tin foil and bake in the oven - en papillotte style. Oven should be at 200 degrees and bake for 8 minutes. The foil parcel will puff up creating steam within the parcel, thus steaming the fish. Just add a splash of water into the parcel before closing so there's enough moisture in the parcel to create some steam.